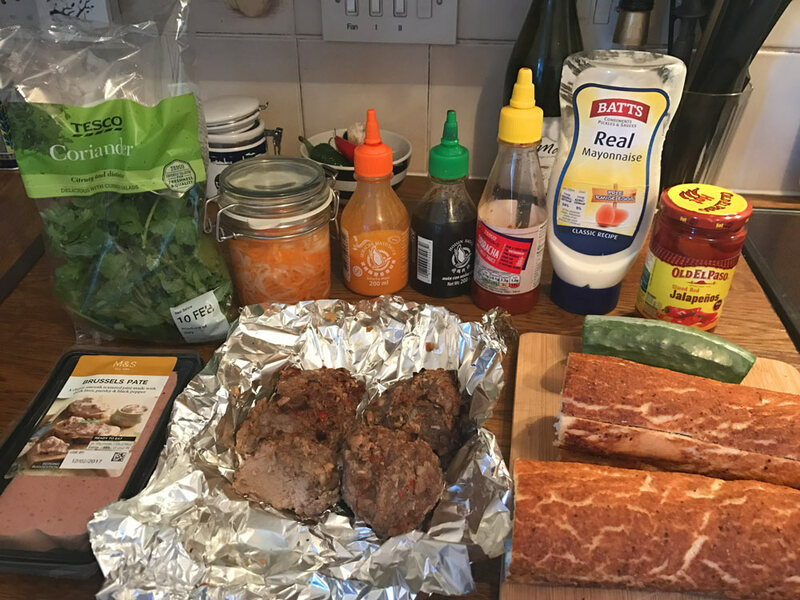 Mix all of the above in a bowl and and pour onto the pork fillet pieces then leave to marinade for a few hours or overnight in the fridge, turning occasionally and spooning the seasoning on top to make sure the meat absorbes all of the flavour on both sides. The longer the better. Warm the oven up and place on around 180C, once warm place the pork fillet pieces topped with the majority of the chopped chopped pieces of garlick, chilli and shallot that’s been used to marinade it in the oven for around 25 minutes depending on your oven but make sure it’s cooked through. Leave it to rest for 15 minutes then carve into thin slithers. Julienne the carrots and daikon and place into a deep bowl. 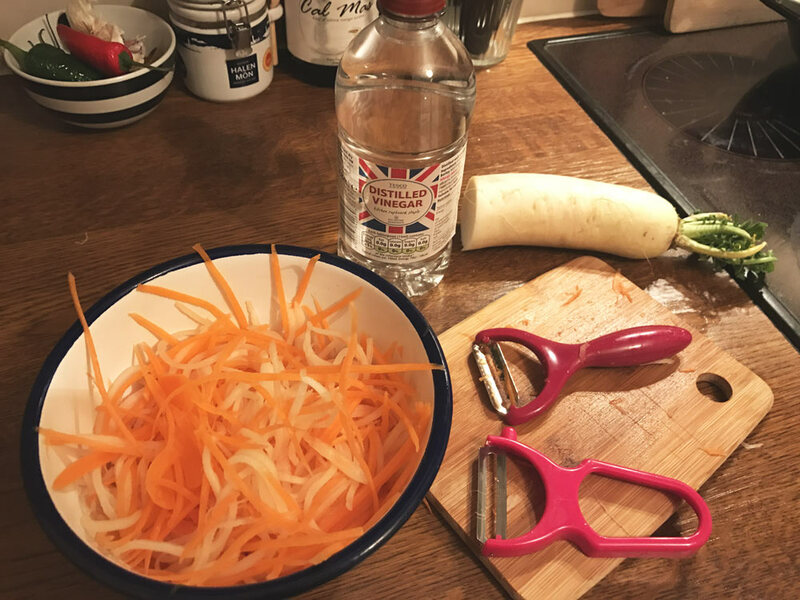 I use a potato peeler style juilienne handle I picked up from TK Maxx but i’ve seen them in a lot of kitchen shops for around £5 and it’s my favourite gadgets in the kitchen for making salads and slaws. Add the salt and sugar from the pre salting ingredients above and mix in with your hands for around 30 seconds then leave for another 3 minutes for the water to leach out. Squeeze the carrot and daikon mixture to release any excess liquid then run cold water into the bowl giving a squeeze and emptying a few times to get rid of the salt mixture. Dissolve the salt and sugar from the post salting ingredients list in the warm water and when fully dissolved add the vinegar to the mix. I had two sterilised medium sized mason jars with a clasp and filled each one with an equal mix of the carrot and daikon but use one larger one if you have it. Top with the vinegar solution so that the vegetables are fully submerged. I topped it up with a tiny bit of water as there was just a few straws of veg poking above the mixture then put in the fridge to pickle. Some recipes i’ve seen said you can use them after a quick pickle of 30 minutes but I opted to do them and leave overnight in the fridge. Cut chunk of bread to your liking depending how hungry you are and whether you’re sharing or not. Slather a wedge of pate on the bottom of the sliced baguette, topp with the cucumber battons then expertly layer the sliced pork to sit on top. Spread a good dollop of your mayo on the top half of the bread wheather you want to go spicy and add some Sriracha is up to you. I did but Mwsh didn’t want any as she was being a wimp this morning. Sprinkle some chopped corriander so it sticks to the mayo combo then add a little squirt of hoi sin over the pork. I use a glass kilner jar with clasp to allow me safe transport to work as plastic Tupperware boxes have exploded more than once in my bag and left me pulling the last few strands of hair out damping down and sponging as it’s leather and won’t go in the washing machine. Mix the instant oats with the yogurt to make sure all the oats are coated otherwise they will be dry and chewy if not fully incorporated. Add the milk a bit at a time till you get a good consistency but remember the oats will absorb the liquids overnight so you always need a bit more than you think but can top up in the morning if too dry. Put in the fridge overnight and top with your favourite fruit in the morning at your leisure. Around 75g your favourite chorizo sausage chopped finely. I used venison and chilli from a recent trip to Borough Market in London. Crack the eggs in a bowl and whisk. Add the chopped onion of choice, chorizo and crumble the feta into the mixture. Oil a muffin or yorkshire pudding tin and divide the mixture between the holes in the tray. Cook in the oven on 200C for around 12 minutes but check from 10 minutes and every two minutes until cooked to your desired liking. Remember the cheese and chorizo oil will mean it will be slightly moist and mushy to the touch but if you take them out and leave to rest for a few minutes they will continue to cook in their residual heat. Eat immediately or refrigerate when cooled slightly and warm in the microwave for breakfast the day later. You could add any other cheese of your preference but halloumi probably wouldn’t work so well as it keeps its shape and won’t melt into the eggy mixture whilst cooking. You could add some mustard to the mix, chiptole tobasco, peas, spinach, bacon, salami, ham, finely chopped broccoli or chopped tomato so get experimenting. Cook the sausages in the oven for around 20 minutes to brown and almost cook. Chop into bitesized pieces and set aside. Peel the outer skin of the butternut squash and either spiralize or I bought a small potato peeler like julienne peeler for around £5 in TK MaxX and used that to cut into linquine shaped strips. 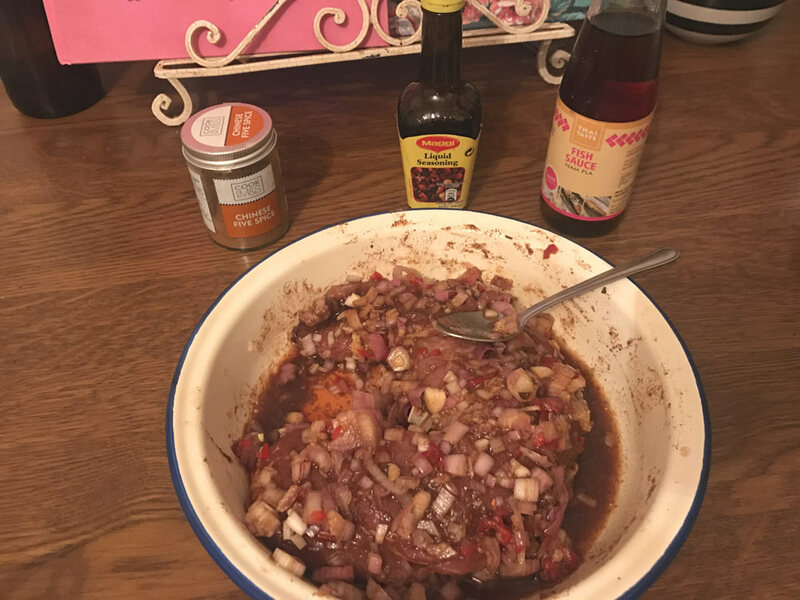 Fry the red onion for a few minutes to brown, add the chopped garlic and cook for a further minute then add the julienned butternut squash, a good glug of olive oil and use tongs to evenly coat the oil and onion mixture. Cook in the pan making sure to move the mixture about not to burn for around 8 minutes on a medium heat. Add the sausage pieces to the pan to and any juices and toss in the mixture for a minute. Add the jar of arrabiata to the pan and coat evenly. Warm in the pan then divide between two bowls, grind a bit of pepper and maybe a dousing of fresh parmesan if you want too. Cook the bacon pieces until they render out the fat and start to brown then set aside. Place the chopped leeks and half the chopped garlic with some oil in the oven for about 10 minutes on 200C. Place the chopped cauliflower in a pan of boiling salted water and reduce the heat to a simmer for around 10 minutes checking that it’s cooked and for this so a knife goes through the stalks with little effort but not boiled to a mush like my grandmother as we want it to keep it’s shape. When cooked, drain and set aside. In a sauce pan add the chopped red onion and fry in a little bit of real butter for a few minutes to sweat out, add a sprinkle of sea salt, black pepper and add the remaining garlic. Continue cooking for another minute or two. Add a tablespoon of the cornflower to the pan mixing it all in. Add a teaspoon or 2 of the mustard depending on taste mixing it in then add a small amount of whipping cream to make a rue, adding a bit more at a time to make sure there are no lumps. When the mixture is the right consistency and there are no lumps add the rest of the cream and milk and stir well and continue to heat gently. When the mixture begins to get hot add the mature cheese to the mix, stiring to melt and bring to a gooey heaven then take off the heat. Place the cooked cauliflower in a casserole dish spreading evenly to fill the gaps. Top with the creamy cheese mixture making sure it’s evenly coated. Top with the crispy bacon and leek slithers then finely grate parmesan cheese over the top and freshly ground pepper. Place in the pre-heated oven at around 200C for 15-20 minutes until golden and desired cooked finish. 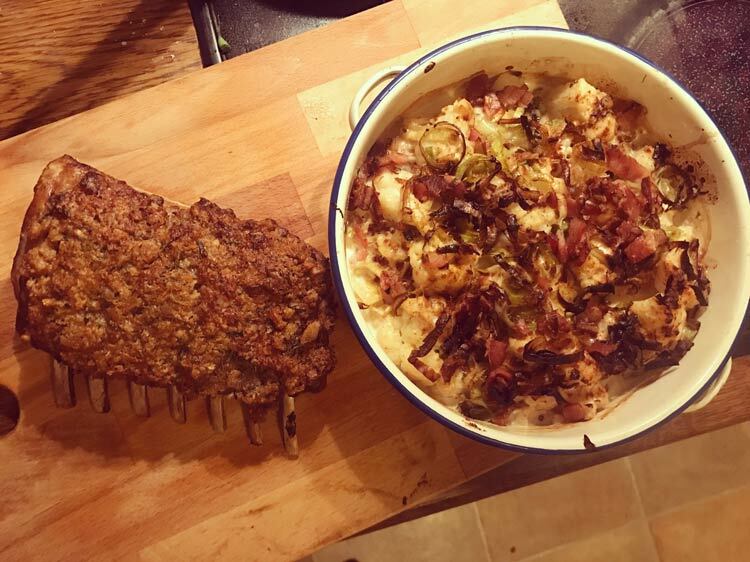 Great accompaniment to my keto inspired wheat free herb crusted lamb rack. Smash the pork scratchings to within an inch of it’s life in the packet with a rolling pin or other heavy object.You could also blitz it if you have a food processor. Mix together the fine scratching dust with a small knob of butter to help bind, the chopped herbs, garlic, salt and pepper in a bowl. Make a crosshatch in the skin of the lamb rack and cook for 2-3 minutes each side in a hot pan. Remove from the pan and let cool for a minute to touch before giving a nice slather of the horseradish and mustard on the skin. Then take the the herb and scratching mixture and pack it onto the crosshatches and mustard coated skin. Place in the Oven on 200c for around 25 minutes depending on size and power of oven. Remove from the oven and let rest for around 10 minutes and carve between each rib to allow you to gnaw at the gorgeous pink flesh and crust with your hands. No knife and fork needed. Chop the onion and fry to a light brown colour and set to one side to cool. Cut a crosshatch shape in the mince whilst still in the plastic container and season with the rasel han’out spice mix to taste and depending on strength of mix i used around 2tsp. Mix the lamb mince, cooked red onion and rasel han’out seasoning in a bowl gently with your fingers making sure not to squeeze too hard or the meat will become too compact and will be dry and tough when cooked. I tend to break bits and massage them into the rest of the clump of meat until combined to a good consistency about 30 seconds then shape into desired patty shape. I don’t like them uniform so just made a kind of oblong rather than burger shape to fit into my pitta bread. In a bowl mix the yogurt and harrisa paste or dry spice. Add a teaspoon and go from there tasting to get the desired punch from the harrisa. You could also add a squeeze of lemon if you want a bit of extra citrus flavour and set aside to infuse. Put a griddle pan on a medium to high heat and cook the lamb patties through between 10-15 mins depending on power of the cooker. 5 minutes before the patties are due to cook place the halloumi slices on the griddle to cook. I prefer a crispy halloumi rather than aneamic looking rubber as I love the texture and saltiness it brings out. Leave the patties rest for a few minutes and put the pitta in the toaster or on the griddle to toast whilst they are resting. Assemble the patties, griddled halloumi, toasted pitta, tossed salad and a dolop of the harrisa yogurt on a plate and make sure to watch your fingers as you devour your masterpiece. Turn your grill / broiler on full to warm. Chop the veg up and put to one side. I usually take a knife and cut crosshatches in the mince whilst still in it’s plastic container to break it up a bit. Scatter the turkey thigh mince to cover a regular oven tray lined with foil and sprinkle over the garlic granules, mixed herbs, small bit of sea salt and liberal dollops of the jerk seasoning. Top with the chopped vegetables and mango making sure to scatter it over evenly. I sprinkled a bit more garlic granules, salt and jerk sauce over the top and a small glug of olive oil over the top. Position the overn tray containing the turkey mince and mixture under the grill about 6 inches from the grills so that it cooks through but doesn’t burn. 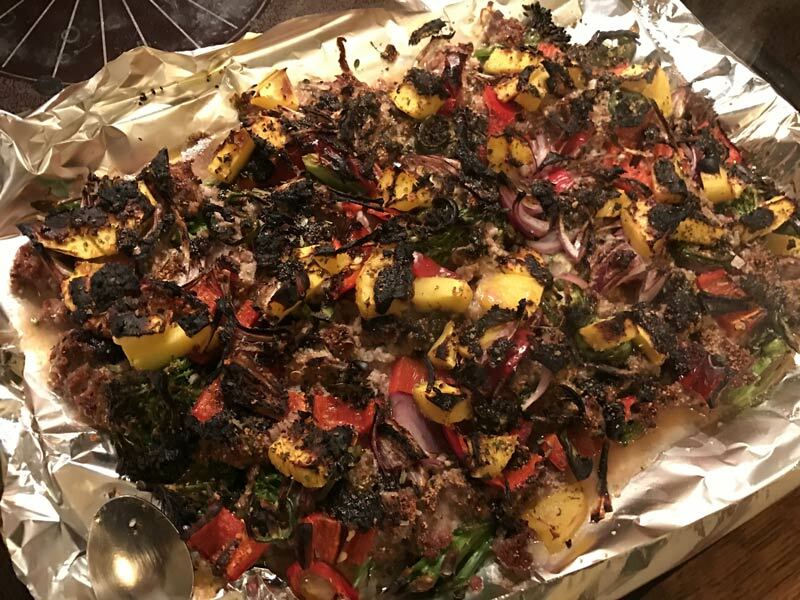 Cook for around 15 minutes depending on power of the grill but check after 10 and go from there. May sure to check the colour and temperature of the mince as it should be cooked through with no pink or blood showing as this is a white meat and can’t be eaten medium. I pulled mine out and let sit in the juices and pan for 10 minutes after to make sure it was cooked through. I find grilling like this instead of making burgers or meatballs means the meat doesn’t dry out and is less mess. If warming up to eat later on or the day after cook in the microwave and stir to toss and coat the ingredients in the juices. This recipe is great with loads of things for lunch such as stuffing a pitta or flatbread, on a jacket potato, sweet potato mash, with a bit of salad or straight up on is own as it’s a meal in itself with the meat and grilled veg. You can add some of your favourite dried or fresh fruit if you like from fresh blueberries, strawberry, kiwi, mango,rasberries, blackberries, chopped almonds, toasted coconut or any other nuts. Mix the oats in the yogurt then add the milk a bit at a time stiring as you go along to make sure it is fully incorporated so that you don’t have dry clumps in your proats. I tried making chocolate and peanut butter the day before but ended in disaster. I used a pouch of chocolate whey protein from my recent Tribe box, which seemed to heavily overtip the balance of other ingredients.